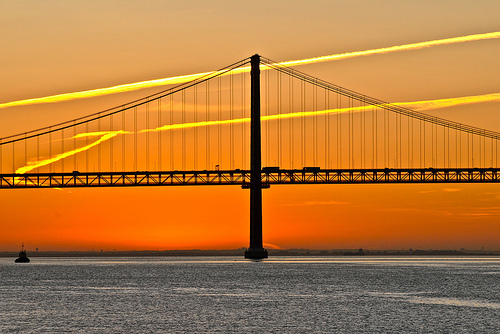 Bridge over Tagus river, Lisbon, Portugal. Photo by flickr user F H Mira. I’m a fan of Ethan Zuckerman’s research on bridging across cultures and the ways in which our communication and networking systems can either encourage interactions across cultural divides or impede them. But what happens when the cultural bridging that needs to happen is within a single organization? A nonprofit has a team of folks who focus on technology, the web, social media, and perhaps even a mobile strategy. Those folks are smart, committed, and capable, and they come up with great ideas for deploying the tools and technologies, but the organizational decision-makers nix the ideas one after another. The easy explanation is that the folks in positions of authority are too old school, or too conventional, or too set in their 20th century ways. Communication channels that we don’t control! Letting other people talk about us – say whatever they want! – on our own website? Giving up control over the message? No doubt this sort of risk intolerance, command and control mentality, and generational divide are all part of the problem sometimes. But I wonder if sometimes that’s just too convenient of an answer. After all, if that’s the explanation, then there isn’t much you can do about it. But I wonder if, at least sometimes, the answer has as much to do with the political savvy of the techies and with the depth of the cultural divide that separates them from others in their organizations. Even with good, dedicated activists on both sides of that conversation, if the techies don’t understand the politics of direction-shifting within their organization, or if they aren’t able to effectively explain their vision and its value even when they do understand the politics, they are going to get stuck – great ideas and no ability to implement. And that sounds very much like the sort of bridging problem that Ethan describes. If this diagnosis is right at least some of the time, the remedy may look a lot like the sort of remedy that Ethan describes: people who bridge those two cultures (i.e., people who get both the techie world and the world of internal nonprofit politics), and communication and social structures that foster unexpectedly delightful interactions between folks on both sides of that divide. I don’t much care for the thought of adding more layers, especially within the larger nonprofits that often seem overly layered already, but if improving internal organizational dynamics and the willingness of those organizations to evolve and experiment is tied to people who can help bridge intra-organizational cultural differences, it might well be worthwhile.